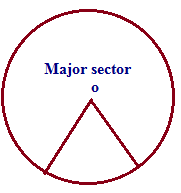 The major region between an arc and two radii joining the center to the end points of the circle is called a major sector. Mass of an object is the fundamental property of the object. It is measure of amount of matter in the object. Mean is same as average. It is calculated by adding all the given series of numbers and divide the sum by the number of the given numbers. Example: Find the mean of 2,3,5,6,5,7,7. Median is the middle value of the given (arranged in either ascending or descending order) numbers. The numbers should be in ascending order.Here the given number is in ascending order.So we have to choose the middle value. 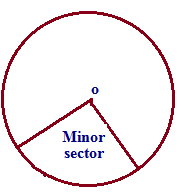 The minor region between an arc and two radii joining the center to the end points of the circle is called a minor sector. The point that exactly in the middle of the number pattern. In the above pattern the middle value is 0.So the midpoint is 0. Mode is nothing but most repeated value in the given number pattern. Here the most repeated value is 3.So we can decide 3 is the mode of the pattern. An algebraic expression which is having single term is called the monomial. Multiplication is nothing but adding the same number over and over. This is also called repeated addition. This would be very useful for kids.Without memorizing this table we cannot do any multiplications problems. We will update regularly this page Math Dictionary-M. We welcome your valuable suggestions. please use the box below to express your suggestions.